In some instances, the quality of a person’s voice provides a clue to their personality. In the case of John Rae, a booming voice reflects an equally strong presence and a gripping message to boot. The 62-year-old Toronto native has devoted his life to representing blind and disabled Canadians as a speaker, writer and, most predominantly, as an advocate for the rights and abilities of people like himself. At around age 5, Rae was diagnosed with retinitis pigmentosa. He was subsequently told that his vision would remain constant but it didn’t. “Many doctors are unable or unwilling to tell patients the truth about their condition,” he says. “They feel their role is to cure their patients and they’re not able to deal with disabilities. As blind people, we’re not sick and we don’t need to be cured. What we do need are opportunities to succeed and alternative techniques to help us do so”. Rae describes experiencing the characteristic stages of retinitis pigmentosa: loss of colour perception, night blindness, and gradual loss of vision, followed by complete loss of vision. He says that unlike many people in the same situation, he escaped the emotional trauma usually associated with vision loss. Instead, he has a practical mindset. He received only minimal orientation and mobility training and he feels strongly that this type of training should be a requirement for the vision-impaired and should be provided at an earlier age than it usually is. One rarely talked-about issue regarding living with a vision impairment is important to Rae: that of an overprotective home environment and the inadvertent harm it can cause. When he found himself faced with this predicament, he chose to leave home to attend theUniversityofWindsorand gain his independence. Rae contends that it is important for parents to have high expectations of their children, “but many of us have had to fight to overcome the effects of over-protectiveness and having a sighted person to do things for us. Being able to advocate for yourself is a skill that stands a person in good stead in school, at work and in community life”. While he studied history and political science, Rae’s true passion was law, until he realized that, “Perry Mason and the practice of law have very little in common”. In addition, he explains, “It was more difficult to obtain books in alternate formats back then – in Braille, tape or audio form, for instance. Braille is a blind person’s road to literacy. If you’re studying law, where every comma can make a significant difference to the interpretation of a text, you’re going to need Braille”. Rae retired from full-time paid work six years ago. However, true to his heartfelt calling, he relishes his career as a civil servant, an active union member and a community advocate. His vast experience included working forOntario’s Disability Support Program (ODSP), which reports to the Ministry of Labour, and the Employment Equity Commission. That was followed by several years with the Accessibility Directorate of Ontario. Currently Rae is a full-time volunteer board member and first vice-president ofAlliancefor Equality of Blind Canadians. He also serves as the first vice-chair of the Council of Canadians with Disabilities and is active with the Ontario Disability Support Program Action Coalition, an advocacy group that is seeking improvements toOntario’s social assistance program for individuals with disabilities. 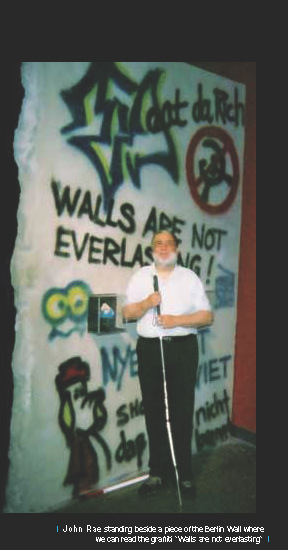 He focuses on policy work, speaking, writing and advocacy, trying to change the way in which blind people are portrayed. Much of Rae’s time is focused on issues such as fighting poverty, access to information, and accessibility regarding web sites and transportation. “We’re trying to reduce barriers in our way. Unfortunately, new technologies have imposed several new barriers such as airport kiosks with touch screens which blind people cannot operate. On the plus side, a growing number of elevators have Braille or raised numbers and some ATM banking machines feature speech, allowing a blind person to bank independently”. Rae is an avid traveller and has sojourned to 30 countries. He feels it is extremely important for blind individuals to travel. “Since we can’t see, we need to absorb the smells and sounds of a locale,” he explains. Rae also points out that because vision-impaired individuals cannot rely on photographs as travel souvenirs, travelling with a tour guide who talks a lot provides tremendous information about the locale. In the same vein, Rae loves touring art galleries and museums because each person viewing a work of art describes something different to him, allowing him to piece together his own picture. This active spokesman encourages people to get involved with consumer groups and organizations for individuals with disabilities in their area. The Alliancefor Equality of Blind Canadians publishes the national magazine The Canadian Blind Monitor, available at the organization’s website: http://www.blindcanadians.ca/. The publication profiles blind, deaf-blind and partially sighted individuals and serves as an inspiration for people of all circumstances to be the best they can be and to define success on their own terms.